OSP Real Estate also supports RTL Language Layouts and especially it is designed to use with OS Property extension. 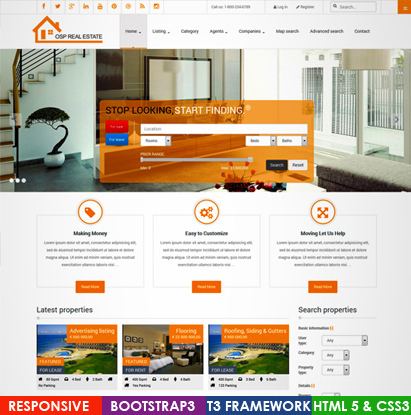 OSP Real Estate is a versatile Responsive Joomla template for Real Estate Websites. With no exception, OSP Real estate is built on the powerful T3 Framework making it a fully responsive Joomla template at default, having all the great features T3 Framework has including ThemeMagic and Layout Configuration tool. OSP Real Estate comes in 6 color schemes. Apart from the default color - Orange, this elegant Joomla template also came with 4 other colors including: Green, Red, Blue,Pink and Teal.